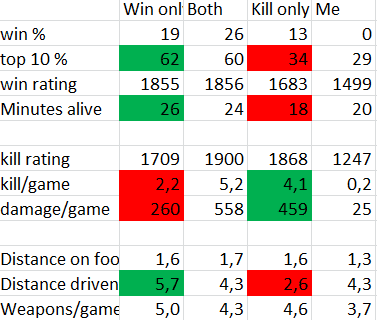 Here are the averages for the only top winners, only top killers, top both listers and me: The win-related statistics are obviously higher for top winners, while the kill-related ones at the top killers, the interesting thing is the distance covered on vehicles, top winners drive twice as long as top killers. I also drive a lot and it's a crucial part of my strategy. It's both good and bad news. 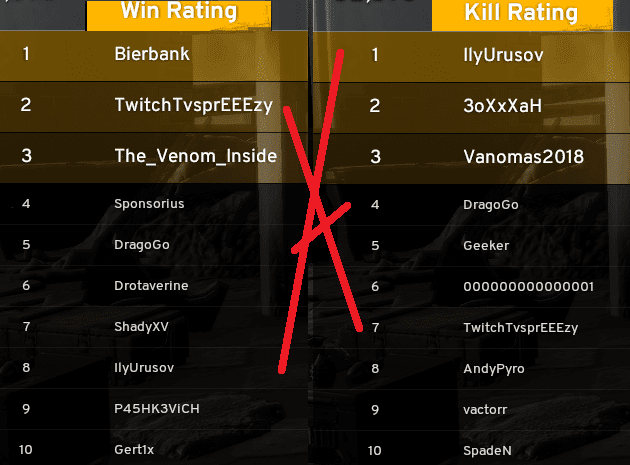 It's bad, because I probably can't reach top 10 as my strategy isn't unique, all top winners do the same as I do. The good news is the same: I figured out the winner strategy which is used by all good players. And no, it's not involving toilets, it involves moving much more than most players, especially the killers. Now to my own position. It's clear that I'm held back by my lack of ability to kill opponents. I kill 10% of what top winners do. Top winners don't kill many either, they probably do what I do, just better. The problem is that if someone finds me and assaults my position, he likely win, so I can only rely on stealth. 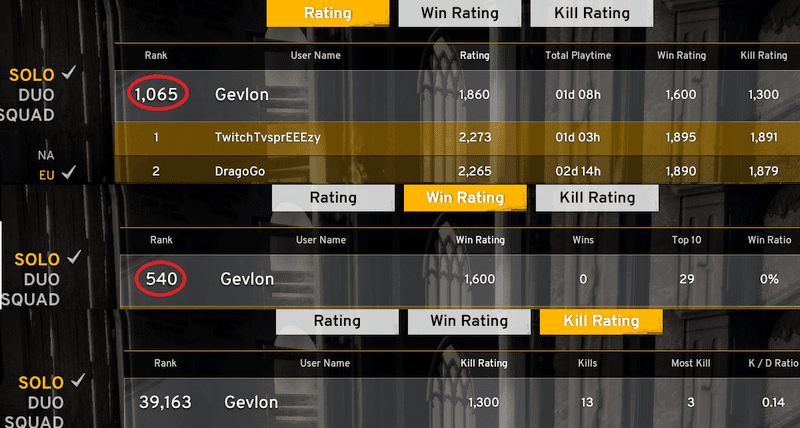 I could still get into top 10 at half as much games as the top winners with 1/10 kills, so I'm pretty good at stealth, but it's not good enough. I must be able to kill those who come after me. I don't expect or need 2 kills/game, but probably 0.5-0.7 is needed to reach the 60% top 10 rate. When you have to fight someone what type of gun do you use? Shotgun, assault rifle, sniper etc. Are you held back by your reaction time or aiming skills mostly? Assault rifles when I can get my hands on them. The main problem is that I keep shooting them and they just don't die fast enough. When I successfully kill one, 15-20 bullets are missing from the mag. If they can respond in that time, they can kill me with one, probably by being able to headshot while moving. Completely off topic, but this is getting too hilarious not to share. Not implementing some countermeasure to gold speculation was definitely incompetence, not malice. These guys simply have no experience in running a game company. Then again, being DDOS'd and ransomed since almost a week now surely isn't fun. @Hanura: this is the dumbest ransom letter ever. I guess they looked easy mark for some low key criminal. Gold sellers wouldn't demand ransom, they'd demand access. Not thinking about countermeasures can be incompetence. Not implementing after the forums exploded was malice. There is simply no negative to do so. @Gevlon access to what, the servers? That would probably just land them in prison, as it is very hard to disguise their IP forever, even with Tor. And of course there are negatives to implementing countermeasures for gold speculation, some of their customers are opposed to them (albeit for stupid reasons). Gold sellers arent demanding the ransom, the people they hired are. Gold sellers are angry because you cant trade gold anymore. 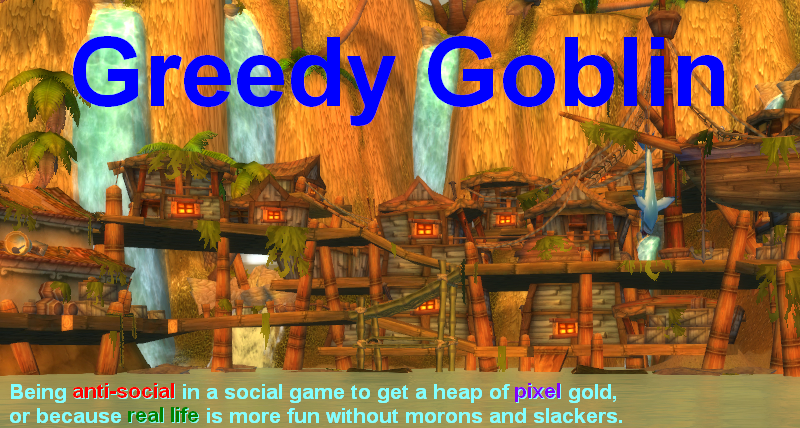 The rest of the players are sitting waiting for the glut of gold in the system to wash out. More evidence of non corrupt developers.